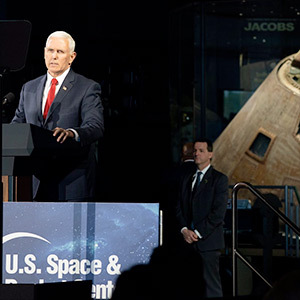 — Citing a new space race against complacency and the need for a renewed sense of urgency, Vice President Mike Pence on Tuesday (March 26) announced that it is now United States' policy to return astronauts to the surface of the moon by 2024 using "any means necessary." 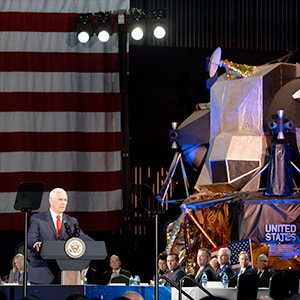 Pence, speaking at the fifth meeting of the National Space Council while standing under an Apollo Saturn V rocket at the U.S. Space & Rocket Center in Huntsville, Alabama, said that landing astronauts at the moon's south pole within the next five years is "the next giant leap" for America. "Fifty years ago, one small step for man became one giant leap for mankind," said Pence. "Now it's come the time for us to make the next giant leap and return American astronauts to the moon, establish a permanent base there and develop the technologies to take American astronauts to Mars and beyond." In 2017, President Donald Trump signed White House Space Policy Directive 1, directing the nation to "lead an innovative and sustainable program of exploration with commercial and international partners to enable human expansion across the solar system and to bring back to Earth new knowledge and opportunities." The policy included the goal of returning astronauts to the moon, but did not include a deadline by which to do so. In the two years since, NASA has worked on developing a plan to go to the moon, introducing the Gateway as a platform in lunar orbit from which to deploy reusable spacecraft to the moon's surface and continuing the work on the Space Launch System (SLS) heavy-lift rocket and Orion crew capsule. Delays in those programs though, pushed the first flight of the SLS into 2021 and the prospects of a landing humans on the moon to late into the next decade. "The truth is, despite the dedication of the men and women who are designing and building and testing the SLS, the program has been plagued by bureaucratic inertia, what some call the 'paralysis of analysis,'" said Pence. "After years of cost overruns and slipped deadlines, we're actually being told that the earliest we can get back to the moon is 2028. Now, that would be 18 years after the SLS program was started and 11 years after the President of the United States directed NASA to return American astronauts to the moon." "That is just not good enough. We are better than that. 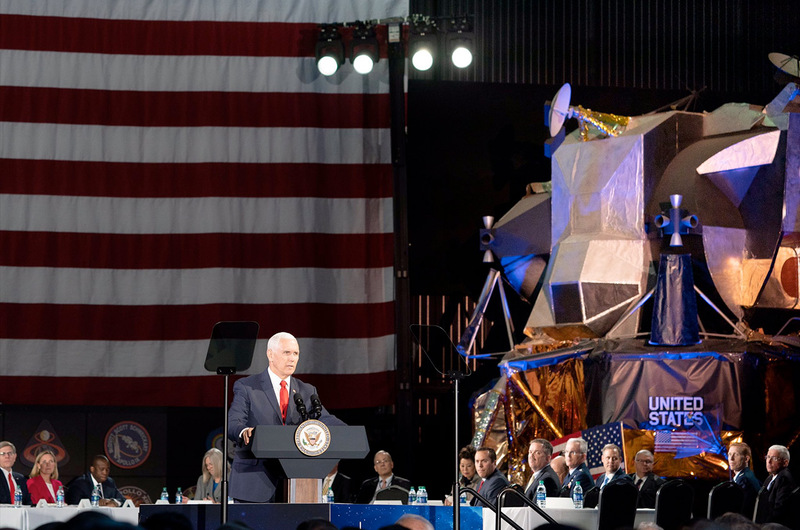 It took us eight years to get to the moon the first time 50 years ago, when we had never done it before, and it shouldn't take us 11 years to get back," the Vice President said. Pence said that we have have the technology, but "what we need now is urgency." "Make no mistake about it, we're in a space race today, just as we were in the 1960s," he said. "But it is not just competition against our adversaries, we are also racing against our worst enemy, complacency." That said, Pence believes NASA is ready to meet the challenge. "Just as the United States was the first nation to reach the moon in the 20th century, so too will we be the first nation to return astronauts to the moon in the 21st century," he said. "At the direction of the President of the United States, it is the stated policy of this administration and the United States of America to return American astronauts to the moon within the next five years." 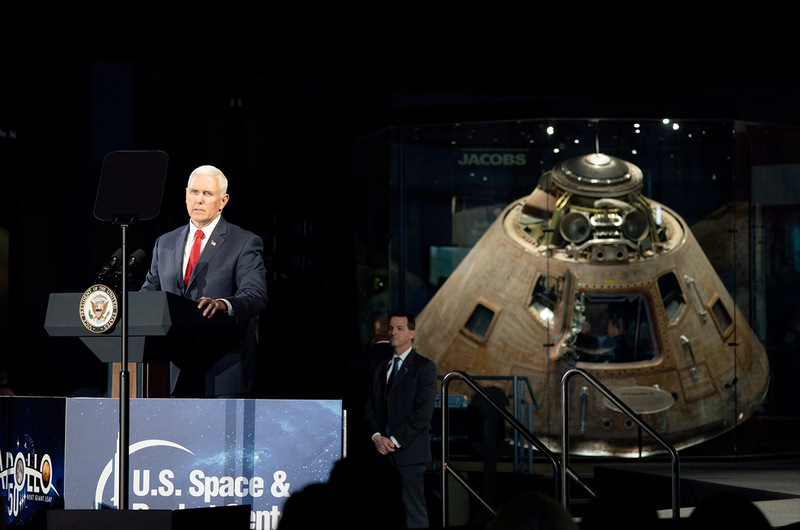 "The first woman and the next man on the moon will both be American astronauts, launched by American rockets, from American soil," proclaimed Pence. 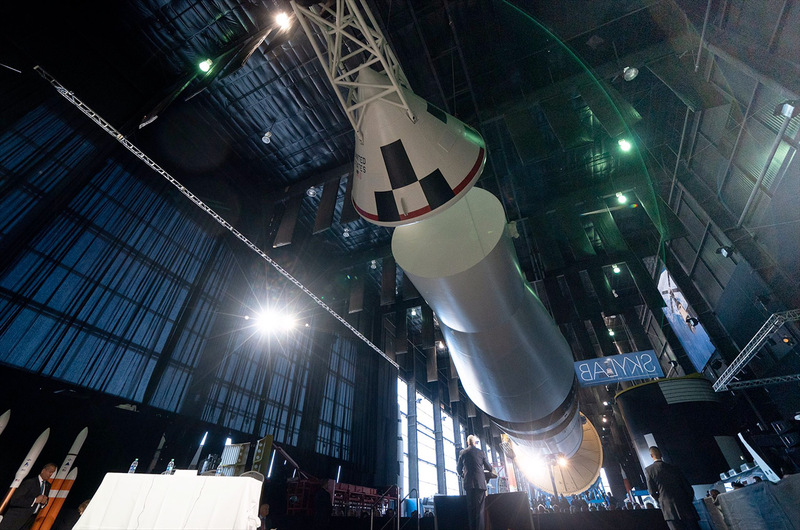 To accomplish that goal, said Pence, NASA needs to accelerate the SLS program, but also consider all available options, including "industry, government and the entire American space enterprise." To achieve a landing within five years, Pence added, NASA also needs to set its destination today." "NASA already knows that the lunar south pole holds great scientific, economic and strategic value, but now it is time to commit to go there," said Pence. "Today, the National Space Council will recommend that when the first astronauts return to the lunar surface that they will take their first steps on the moon's south pole." NASA Administrator Jim Bridenstine, replying to the Vice President, said that the space agency will do everything in its power to meet that goal and deadline. "You have given us a charge today, and it is right on time," said Bridenstine. "The challenges that you outlined today, and we've talked about in your office, with SLS and making sure that we can accelerate the agenda, we understand that. We got that loud and clear." 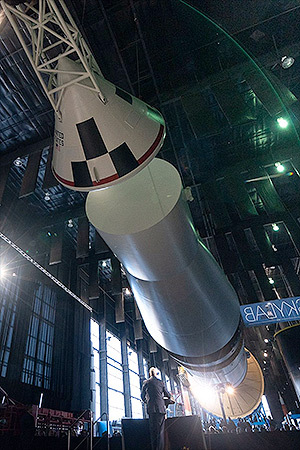 Bridenstine said that there exists a future opportunity for commercial partners to become part of the new lunar program, but to accomplish a landing by 2024, an accelerated SLS program is required. "When we talk about being able to co-manifest payloads, about putting humans on a spacecraft with a habitation module at the same time and delivering them to the moon all at once, we're going to need an Exploration Upper Stage and we're going to need that probably early," said Bridenstine. "So there is a lot to achieve. We are working now at making sure every moment of time that we are using to develop SLS and the Orion crew capsule, we are only doing what is absolutely necessary to get to that first launch." "I am confident we can get to that first launch in 2020 for SLS and actually fly the crew capsule around the moon," he said. "And we will be using the Gateway as a reusable command module to get boots on the moon as soon as possible." Pence, in closing his remarks, cited the Apollo program as an example that speed and efficiency did not need to come at the expense of quality or safety. No one, he said, was being asked to undertake unnecessary risks. 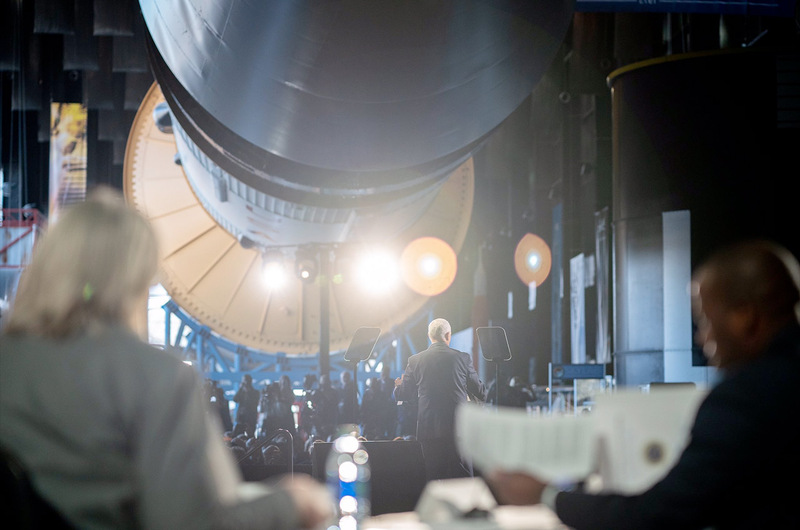 "Rather we are challenging everyone involved in America's space enterprise to think bigger, fail smarter and work harder than ever before," said the Vice President. "Failure to achieve our goal to return American astronauts to the moon in the next five years is not an option."